Seiko 6105-8000 Resist-Proof 1868 any hope? The gentleman was very happy to see it go to a good home. I asked for his price, he gave it to me, we shook hands and made the transaction. When I brought it home, I looked at it closer with my loupe, and discovered that the watch did not run, and even more devasting its current internal condition. The watch has a lot of corrosion from what I can see, and what the pics have revealed. 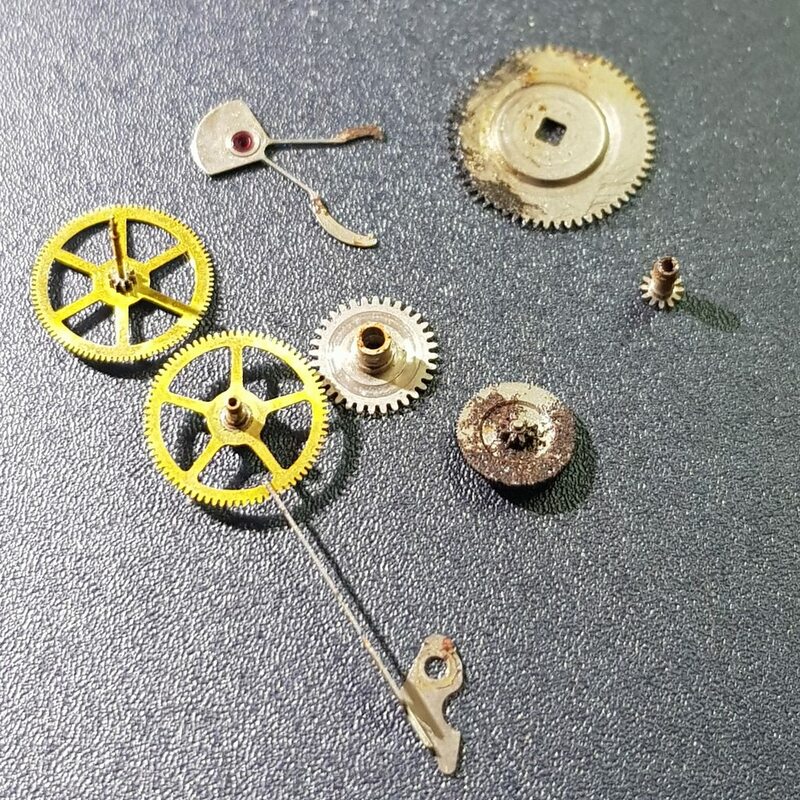 My sincere desire is for the watch to have a second chance with minimal restoration, but the reality of it is, even for me a novice, that would be quite the long shot. Please let me know your thoughts, and whether he has another shot, and yes, Hope of running again. Thank you. if you have any questions or need additional information please let me know. Thank you. Hi and welcome. I think the movement will be ok but until someone looks at it it's difficult to know how much damage is present. Here is what needed to be replaced on one that I think was in slightly worse condition than that. Although there maybe screw heads that strip or other issues, I would be optimistic it will be fine. The crown is wrong and the seconds hand is a shorter version. If the seconds hand alone was incorrect I think I would have to consider seiko being their usual inconsistent selves....however as the crown is also wrong as it's for the second gen 6105, then I'd say both have been swapped over to this watch. Stories of ownership and all that originality stuff sometimes need a healthy dose of sceptismicm, really. Either way, a good strip down and service of the movement along with a new crystal (repro) and crown should turn it around nicely. Just to add that I'm a little unsure of he hour and minute hands. The lume plot on the hour hand particularly looks too narrow and too short. There are similar hands found on a 7009 dress watch among others that could be what those are. Tricky to see from the photos. Without forcing anything, does it run at all? Does the crown operate the hands (don't rotate if it feels rough or seized). Does the date change? Again don't force anything it should feel easy to operate. I would say '68 is way too early for a resist dial. I've had a couple of 8000s with proof/resist compose but they were '71 when there seems to have been a transition period. Where are you based? Plenty on here who will sort it for you. I apologize for the late reply. I'm in Orlando, Florida. I have contacted Mr. Spencer Klein about servicing the Seiko. I see those restorations that they do on those beautiful muscle cars, and the only thing original is the shell, as they have been extremely modified and/or restored. I don't want that. I'm happy just by seeing the watch run. Thanks again.